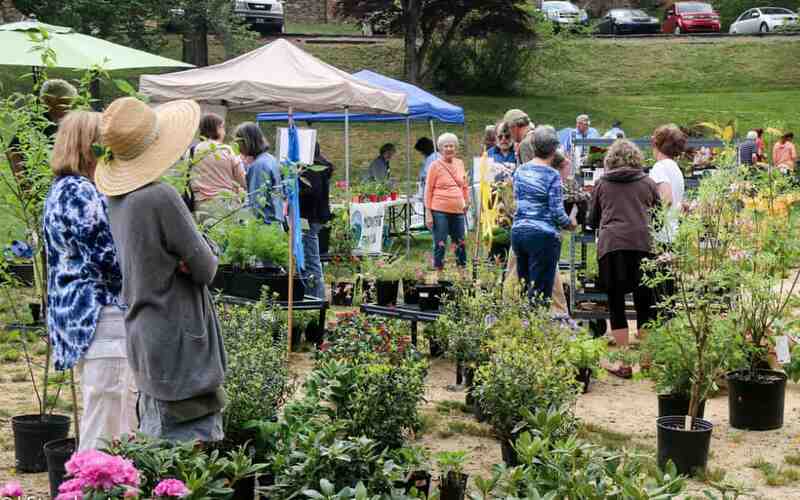 The Seventh Annual Montreat Native Plant Sale and Arbor Day Celebration will take place on Saturday, April 27th, from 9:00 am to 2:00 pm. at Moore Field, next to Lake Susan in Montreat. The goal of this event is to “Promote awareness and use of native plants in yards, gardens and landscapes, while avoiding introductions of invasive, non-native species.” The public is invited to experience a festive atmosphere that includes live music, food, and fun activities for children such as how to “Be a Tree” and meeting salamanders up-close! At least seven Western North Carolina nurseries will be offering a wide variety of native and other plants for home and garden. Informative programs ranging from the life that is in Flat Creek to the history and heritage of Montreat’s environment are planned throughout the day. Gardening and plant experts will be on hand to answer questions. Several children’s activities will be offered. Rhiannon and the Relics are providing live music. A food truck will be serving delicious offerings all day. New this year, a raffle with items from local individuals and proprietors will be held. The Montreat Landcare Committee and the Montreat Tree Board are pleased to sponsor this popular event for the greater community of Montreat, the Swannanoa Valley, and beyond. Come, learn and enjoy! Please visit this page again soon for a complete schedule of activities.